Exercise for the body and relaxation for the mind. Nordic Walking uses specially designed poles to enhance your “walk”. Derived from cross country skiing it changes your walk into a full body workout. Inclusive, low impact and great for children and adults, it takes you into the fresh air all year round. Improving balance and co-ordination, Nordic walking tones upper and lower body, releasing tension and relaxing the mind. We understand that not ‘one size fits all’. Everyone is different, so why should our teaching and classes be the same for all of our walkers? We give personal attention applying our knowledge and teaching to match your individual requirements, so that you can get the most from our sessions. Derived from Nordic Ski-ing, Nordic Walking engages 90% of skeletal muscles, burning 46% more calories compared to normal walking at the same speed. It tones the upper and lower body, improves balance, co-ordination and core body strength. Nordic Walking is great for easing stiff joints and releasing neck and shoulder tension. Give yourself a new experience, create headspace and time to think clearly and reflect. Meet new people and make new friends. Leave your phone and technology behind, reconnect with nature and take in the environment around you. Learn the first 5 steps of Nordic Walking, then refine your technique to cover the full 10 step programme. Enjoy the success and benefits that the full technique provides and be proud of your achievements. Whether it’s exercise for an individual, with a friend or in a group, Nordic Walking is a sport for all. Dr. Thorwesten of the University of Munster, Germany, showed that muscle exertion in the arms (11-14%), core, and legs increased when walking with poles, as opposed to regular walking, and the participant’s endurance increased significantly. However, the benefits were seen only in those who used the correct Nordic Walking technique. “A mixture of healthy exercise, green space and nature combined with fun has been thoroughly enjoyed by all ages. So good for mental well-being in our busy lives, it is a sport for the individual or group. Accessible to all! Our girls return with pink cheeks, a smile on their face and a spring in their step." “Age is no bar! Katie will tailor the walks to your ability and ensure your safety and enjoyment. You will soon be surprising yourself with your increasing fitness." 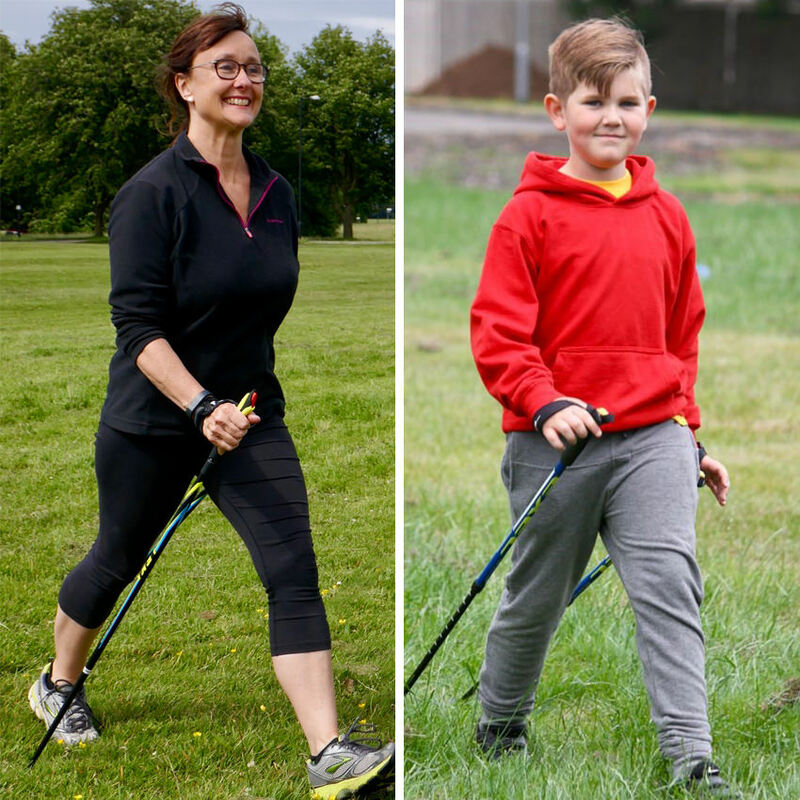 "Nordic walking is great because it exercises your mind as well as your body, you make new friends, it makes you feel refreshed and invigorated, I always leave in a good mood and every week brings a new challenge"
"Nordic walking is great from stretching and learning new and different things. It is a brilliant sport to try and it is great if you don't like other types of exercise." "Katie’s Nordic walking course was great fun. She has exceptional patience and is very encouraging. Katie made all 5 sessions very enjoyable while teaching us the basics of Nordic walking. I could definitely feel the benefits and would recommend learning Nordic walking to anyone who is keen to get active in a way that is kind on the joints but is a great work out! Thanks so much Katie!" “I recently undertook the Nordic4 basic walking course at the instigation of my sister with the intention of trying something new and being a bit sociable. I truly hadn’t expected to find it as pleasurable and beneficial as I have. I have enjoyed the challenge of mastering the basic coordination techniques and trying them out on varying terrains, but have enjoyed even more the feeling of wellbeing I have taken away from each session. Katie’s gentle and thorough teaching style is motivating and reassuring, and I’m now looking forward to joining some regular sessions." "We included Nordic walking as one of the activities in a well being day with Year 9. The students really enjoyed learning the techniques and using their new skills to navigate their way around an orienteering course. It was a fun and engaging session which I will certainly repeat next year." "Was really impressed with your sessions. I have to say I was intrigued with what you could do with 8 children and 16 poles in an hour but Wow is all I can say! Children were engaged who have never been engaged in Sport before!" Cherry Kraus Sport Development Manager, Ashton Park School Sport Partnership, Bristol. "Thank you for a brilliant experience - there is definitely more to Nordic walking than meets the eye. I feel thoroughly relaxed and invigorated." "You’re a great teacher! You’re knowledgeable & very encouraging, which helps us extend beyond our limits." "Thank you Katie for getting me this far. You are such an inspirational and patient teacher." "Katie took great care to understand my needs and tailored each session accordingly... Lessons were fun and gradually I started to feel the benefit, my posture, balance and stability improved, my energy levels increased and as a bonus I dropped a dress size!!"